With 8 red-clay courts laid out on the apron of the Wilder Kaiser mountains in Austria's Tirol, the Bio-Hotel Stanglwirt makes for an uncommonly picturesque setting for this PBI World Tennis Camp. Participants receive more than 20 hours of instruction and programming over five days, equally divided between group clinics and supervised tournaments and other on-court activities. The package includes a welcome reception and closing ceremony, camp awards, gifts, pictures and much more. To book, visit PBITennis.com. A family-run hotel at the foot of Austria's dramatic Wilder Kaiser mountains seems like an unlikely location for one of the most successful tennis camps in all of Europe. Yet Peter Burwash International (PBI) has been running camps at Stanglwirt since 1978. Originally dubbed the Kneissl Tennis Camp the program has since evolved under the multi-lingual staff to become the PBI Tennis Camp. Over those decades, owner Balthasar Hauser has found innovative ways to enhance not only his once tiny guesthouse but also its place in the tennis vacation landscape. Today, it is a 175-room resort and spa with fourteen tennis courts—six of them indoors, which allows tennis to operate year-round. Its location an hour and a half from the Munich airport and an hour from Salzburg makes it easy to reach from much of central Europe (and the U.S., for that matter), and it attracts a local following, many of them young families, particularly from Germany, Switzerland, Italy, and, increasingly, Great Britain. Ordinarily when choosing which side to start on in a match you take factors like sun and wind into consideration. At Stanglwirt, guests joke that the south side is worse, because there you face the distracting view of the soaring Wilder Kaiser mountains, a gray wall of jagged limestone peaks rising steeply to more than 7,000 feet. If that backdrop undermines concentration, it nonetheless adds immeasurably to the pleasure of playing here. So do the superbly maintained red-clay courts. When I first read about this camp I was frankly a little disappointed that it encompassed only two hours a day of group lessons. Not until I attended did I realize that organized tennis continued after those group sessions ended. And not until I visited did I realize that for an American at least the lure of the mountains and the Austrian countryside would be as strong as the lure of the courts. Tennis Staff. Veteran PBI pro Philippe Azar heads up the program. Originally from London, he took up the game early, playing his junior tennis at the county level and later for Exeter University, where he majored in geography and European studies. After graduating, he came to the U.S. on a temporary work visa, signing on to teach tennis at Colorado's Keystone Resort. Eager to stay and keep teaching, he joined PBI in 1998, training in Houston before being posted first to Germany's Vier Jahreszeitan am Schluchsee (he grew up speaking German) and subsequently to Mauritius, the Maldives, Dubai, Beirut, Mexico, Italy, Japan, and The Bahamas before coming to Stanglwirt in May 2016. He was brought in to revamp the program. That includes not only rejuvenating the long-running camp program so that those who come back year after year have new drills and activities to look forward to, but even more crucially to better cater to the young families who now make up the core of the resort's clientele. He sees the need for a structured junior program that would so that in over the course of the week a kid could see some progression by learning some fundamentals and having a wonderful time. He also wants shorter programs for younger kids and more events on the junior calendar, like tournaments. He's also looking at teaming up with other parts of the hotel to create packages that bundle tennis with spa, fitness, sports psychology, golf, skiing. And finally, he's looking to schedule more special events, like the very successful PBI World Camp, perhaps by bringing in celebrity pros in the hope of attracting new clientele. As his plans coalesce, I'll update this page with details. Tennis Programs. Currently, guests enrolled in the PBI camp program get two hours of group instruction each morning (maximum student:pro ratio of 4:1). Hotel guests not in the program can take tennis clinics or private lessons, workout once a week in a Cardio tennis session, play matches (the staff will find opponents), play in a free weekly doubles round robin, and during slow weeks join other guests and campers for midday doubles with the pros. For kids, the PBI staff offers a junior camp program for children ages 4 to 16. During busy weeks, the staff also stages an exhibition or puts on a performance of the lively PBI Tennis Show, a festival of juggling and ball control combined with a spoof of different playing styles. Courts & Fees. 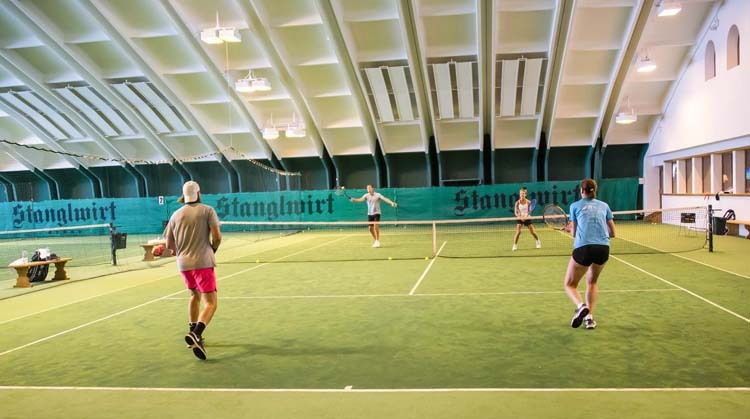 Stanglwirt has eight immaculately maintained red-clay courts outdoors and another six carpeted courts —one of them a multisport court— indoors in V-ceilinged buildings who roofs are covered with grass, the better to blend with the pastureland around them. The indoor courts, which are covered in a new highly elastic surface with a slow bounce, also have their own pub. One of them is now equipped with Playsight, a real-time, multi-camera system with tools to record and analyze play. At the outdoor courts, a small wooden tennis hut serves beverages (the local beer is Huber Brau) and provides glasses for the mountain spring water that flows seeming straight from a branch of wood into a trough carved from a tree trunk. Court fees: €13-€16/hour outdoors, €19-€23/hour indoors (free on tennis packages). Altitude Caveat: Stanglwirt stands at 750 meters (about 2,475 feet) above sea level. Expect the ball to be on you a little more quickly and be sure to pack ample sunblock, especially if you plan to go hiking or skiing. Golf Courses. There is a training center, driving range, and putting at pitching green just steps from the entrance to the hotel. The nearest golf course is 2 km away in Ellmau with another 11 within an hour's drive. Spa. Built partly into the hillside, the spa at the Bio-Hotel seduces guests not so much for its treatments as its design and amenities. Lounge chairs in a sunroom at the uppermost level—a level shared by most of the treatment rooms—look out through floor-to-ceiling windows on that mountainscape of the Wilder Kaisers. To reach that aerie, you climb stairs cut into simulated stone the same gray color as the mountains. Water splashes down the rocky slope in full view of a large rimless hot tub the shape of a mountain pool. Lying there you can gaze at the Wilder Kaisers perfectly framed in the windows of that sunroom above or at an aquarium filled with neon-colored tropical fish and two marauding sharks. Behind the cascading water as if in a cave are a series of saunas—one in translucent stone and called the "Crystal Sauna"—and salt grotto, all of them clothing optional. Leave that area and you follow a set of stairs to an indoor pool, bordered by what seems to be an extension of that rock face and cascading water in the room above with windows on a large grassy inner courtyard of the hotel containing lounge chairs and a kids' tree house. A tunnel from the indoor pool leads directly into a small outdoor pool, both filled with crystal-clear water. Finally, there is a separate lap pool in one corner of the courtyard. All of this is accessible to guests whether or not they book spa treatments. Fitness Center. The hotel also has a Fitness Garden, a 5,400-square-foot (500m²) arena adjacent to the indoor courts. It has been furnished with TechnoGym cardio and exercise stations and a Kinesis circuit training system. Personal trainers are also available and many of the hotel activities now operate out of this new Fitness garden. It borders a wellness area for adults with a saltwater pool, a lap pool with integrated Omega timing devices, more relaxation areas, a large marble steam room, two more saunas, a waterfall grotto, and a swimming lake. Summer: Hiking and Mountain Biking. Hiking trails begin almost at the doorstep of the hotel and head up—and if you choose, over—the Wilder Kaiser mountains. Some are easy. Those at higher elevation can be difficult, as you climb hand-over-hand up rocky paths or along very steep slopes where you're smart to hang onto the cable attached to the rock on the upper side as a handhold. Scattered throughout are mountain huts providing refreshments and even overnight lodging. A map and suggested routes are available from the concierge desk and there are regular guided hikes during late spring, summer, and fall. Meanwhile, for bicyclists there are both paved bike lanes all along the valley floor and paved and gravel forest roads in the mountains themselves. Bikes can be rented right at the hotel and like hiking there are guided outings available in season. Winter: Nordic and Alpine Skiing. There is the first of a series of lifts as close as Going, less than a mile away, and the Kitzbühel and its fabled Hahnenkamm downhill racecourse are only 15 minutes away by taxi. And ... Stanglwirt has Lipizzaner horses and a riding school, complete with a small outdoor equestrian ring. At 9:30 each morning, kids as young as age 3 can meet at the "Kinderstube" in the hotel or the Children's Farm behind or for a full day of activities, including lunch, hay games, pony rides, petting zoo, and more supervised by the hotel's nannies until 5 p.m. (and evenings during holidays). Families, meanwhile, gather in a Children's' Water World, with a 400-foot-long waterslide, multiple shallow pools, bigscreen TV showing kids' favorites, and napping and play areas. The carpeted, wood-rich rooms range in size from an attic-like chamber with twin beds and a large walk-in closet and dressing room to three-room suites. What they share is an abundance of warm wood called zirbelkiefer or "stone pine" that resembles knotty pine and gently perfumes the room, a wood the Hausers believe has healing properties, including has healing properties, slowing heart rate and lowering blood pressure. Supremely comfortable, the rooms have rough white-plaster walls, flat-screen televisions, phones, complimentary high-speed Internet connections, in-room safes, and electronic door locks. All but those smallest attic rooms have balconies or terraces, most with views of the Wilder Kaiser Mountains. Packages include breakfast and dinner. Breakfast is a vast buffet of cheeses (some Stanglwirt's own), deli meats, fish like smoked salmon or mixed seafood, their own yogurt, fresh fruit from raspberries and blackberries to watermelon and pineapple, breads, and a made-to-order omelet bar. Dinner varies from night to night but is typically a sumptuous five-course affair with a different theme each evening: Italian one night, Tyrolean Mountains another, the chef's creations a third. They usually begin with a buffet of salads, fruits, vegetables and cheeses before giving you a choice of entrées, one of which is always vegetarian. There is also a free afternoon snack of coffee, tea, and pastry, served in the library. 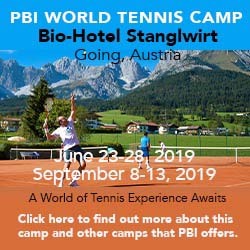 With 8 red-clay courts laid out on the apron of the Wilder Kaiser mountains in Austria's Tirol, the Bio-Hotel Stanglwirt makes for an uncommonly picturesque setting for this PBI World Tennis Camp. Participants receive more than 20 hours of instruction and programming over five days, equally divided between group clinics and supervised tournaments and other on-court activities. The package includes a welcome reception and closing ceremony, camp awards, gifts, pictures and much more. For more information, visit PBI World Tennis Camp. Lodging options range from rooms to large suites with several choices of meal plans. See the website for details for the time you want to travel. Seasons. The indoor courts allow year-round tennis. July, August, and April are the busiest months for tennis camps, though they, too, operate year-round. Travel Instructions. The nearest major international airport is Munich (MUC), Germany, roughly 90 minutes away, though you may also find flights into Salzburg (SZG) and Innsbruck (INN), Austria, each about an hour's drive from Going. General Tourist Information. For specific information about lodging and activities in the Tyrol region, visit www.tirol.at. For general information about travel to Austria, go to www.austria.info.